UPDATED: Sat., Oct. 28, 2017, 11:35 p.m.
TUCSON, Ariz. – Mike Leach could’ve pulled the plug on the Tyler Hilinski experiment at any point in the second half of Saturday’s game at Arizona. And the thought did cross the Washington State coach’s mind a few times, as the Cougars’ second-stringer continued to throw the ball into the hands of the opposing defenders, only making it harder for the visitors to stage a comeback against a team that was far more efficient on offense than they were. Leach thought about it – “I did, I did,” he said after the game – but never did more than that. Hilinski came into the game with 2:56 remaining in the second quarter and never came out. 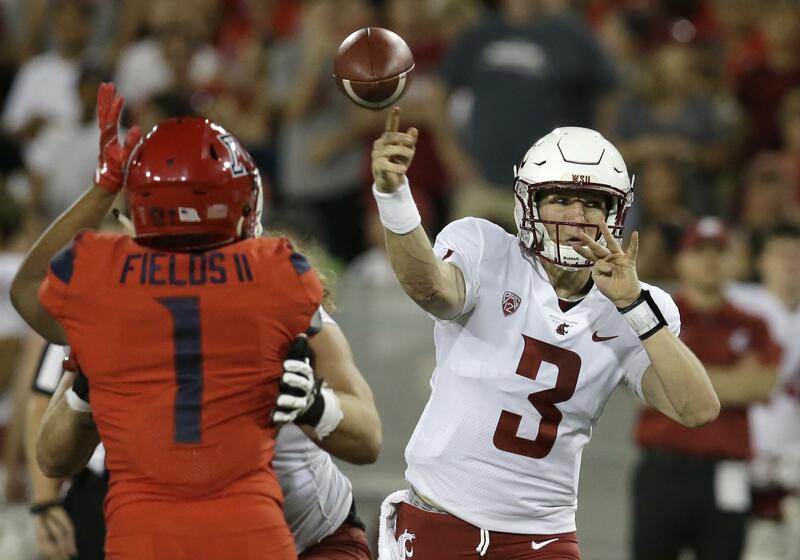 The backup replaced starter Luke Falk on a night Falk needed only 225 passing yards to become the Pac-12’s all-time leader. Asked about the QB shuffle, Leach gave an explanation similar to the one he gave when the coach inserted Hilinski into the Boise State game earlier this season. Hilinski led the Cougars to a 47-44 triple-overtime win against the Broncos after helping WSU climb out of a 21-point deficit in the fourth quarter. So there was a precedent for the decision the coach made Saturday in Tucson. Hilinski threw four interceptions in key moments of the game. None of them hurt more than the one that came with 3:38 to go in the third quarter and WSU trailing by three points. Hilinski tried to float a ball into the back of the end zone, but it never reached its target. Instead Arizona’s Jace Whittaker came down with it and Wildcats put seven more points on the board two plays later when J.J. Taylor broke free for a 79-yard touchdown run. The 14-point swing detonated the Cougars in a game they’d wind up losing 58-37. Hilinski still got WSU’s offense up and down the field in a manner Falk wasn’t able to. The starter finished 13 of 23 for 93 yards and one touchdown, while the backup was 45 for 61, racked up 509 yards and threw two touchdowns. Hilinski was also an effective runner, rushing five times for 19 yards and two touchdowns. Leach didn’t completely rule out a scenario in which Hilinski takes the first snaps in the game against Stanford next Saturday. Published: Oct. 28, 2017, 11:28 p.m. Updated: Oct. 28, 2017, 11:35 p.m.